What is nutritional yeast? And why do vegans seem to like it so much? If you've been wondering about this ingredient which seems to pop up everywhere in vegan cookbooks and vegetarian restaurants, read on to find out a definition and everything you need to know about nutritional yeast. Yellow in color and with a nutty cheesy flavor, nutritional yeast is an inactive yeast that is a favorite amongst many ​vegans because of its unique flavor and similarity to cheese when added to foods (Bon Appetit even calls it "nature's Cheeto dust" - it's that cheesy and that good). Sprinkle some on hot popcorn or garlic bread, or add a generous spoonful to a ​stir fry or pasta sauce. Nutritional yeast is also the only reliable food source of vitamin B12, so if you're vegan, it's a good idea to add some to your food regularly. Where Can I Find Nutritional Yeast? I've yet to ever see nutritional yeast at large chain grocery stores such as Kroger's, Albertson, Publix and the like. You'll have to go to Whole Foods or your local natural foods store. 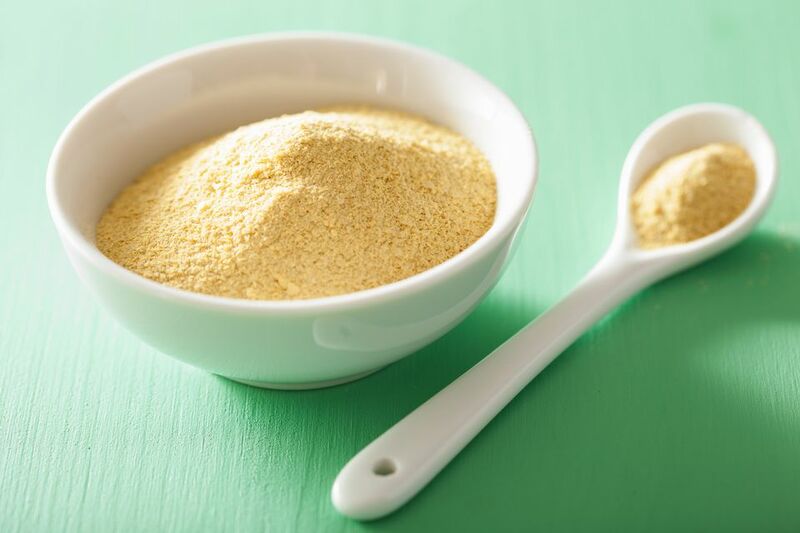 Nutritional yeast can be found in the bulk foods or supplement section of just about all health food stores and co-ops, even the very small ones. You can look for either nutritional yeast flakes or powder (the taste is the same but the texture is slightly different and I don't personally have much of a preference either way), but be sure you don't get brewer's yeast by mistake, as its quite similar in appearance. In Australia and New Zealand, nutritional yeast is also called "savory yeast" or "savory yeast flakes". If you can't find nutritional yeast where you live, you may want to try shopping online for nutritional yeast. Why Do Vegans Like Nutritional Yeast? If you're asking this question, you've obviously never had popcorn sprinkled with just a little bit of nutritional yeast and salt, because then you'd know that nutritional yeast is absolutely delicious. Vegans love the cheesy taste (it's a great Parmesan cheese substitute) and it can be added to just about any meal as a flavor enhancer. But that's not the only reason vegans love nutritional yeast. Nutritional yeast is also a good source of vitamin B12, which is the only nutrient it is very difficult to obtain as a vegan. While there's much debate over the importance and availability of B12 to those who avoid all meat, dairy, and eggs over a long time, most people agree that eating nutritional yeast from time to time is a great solution, because, well, it's delicious. See also: Can vegans eat yeast? On toast, garlic bread or bagels: A little nutritional yeast sprinkled on top of toast or a bagel with vegan margarine is delicious. On popcorn: Add a bit of oil (or melted vegan margarine), salt and nutritional yeast to freshly popped popcorn. Yum. In stir-fries: Just before serving, add a teaspoon or two to a vegetable stir-fry or tofu stir fry. The nutritional yeast will absorb a bit of moisture, so make sure you have plenty to spare. In soups: Add a tablespoon or two to just about any kind of soup, whether you're cooking up a squash soup, a bean soup, or even a vegetarian French onion soup. It goes particularly well in split pea soup. For strongly flavored soups like something spiced with Indian curry, use a little bit less so as not to overpower the other flavors. For anything you would use Parmesan cheese for: On top of spaghetti or just about any pasta dish, on top of veggies to get the kids to eat them (It goes especially well with sauteed greens, green peas, and steamed broccoli). Try this new soy-free tofu, made from hemp! Kale italia - What is kale italia? Have You Tried Halloumi Cheese? I can't believe it's not...eggs? What Is Edamame, and How Do I Eat It? Which whole grains are gluten-free grains? Are Hemp Seeds Really That Good for You? Freeganism: Would You Dumpster-Dive to Save Money?